Drones: The future of warehouse innovation? There was a time when, if someone mentioned a drone, your mind automatically went to “war weapon.” That particular word association has changed within the past couple years. These tiny aircrafts are now available for purchase by the average person and could soon be used to assist us in the warehouse. People fly them through the skies and take pictures of the landscapes down below. Drones can be great for getting aerial views of special events. The technology for these machines improves each year, and they grow more and more affordable as well. You may remember when Amazon began testing delivery drones for their warehouses a few years back. This announcement caused many to wonder what life would be like if drones could deliver your Amazon purchases to your home. If that became the norm for Amazon, it’s possible other delivery services would have to do so as well to stay in the game. Can you imagine delivery drones flying around everywhere? It’s a very futuristic sight to imagine! 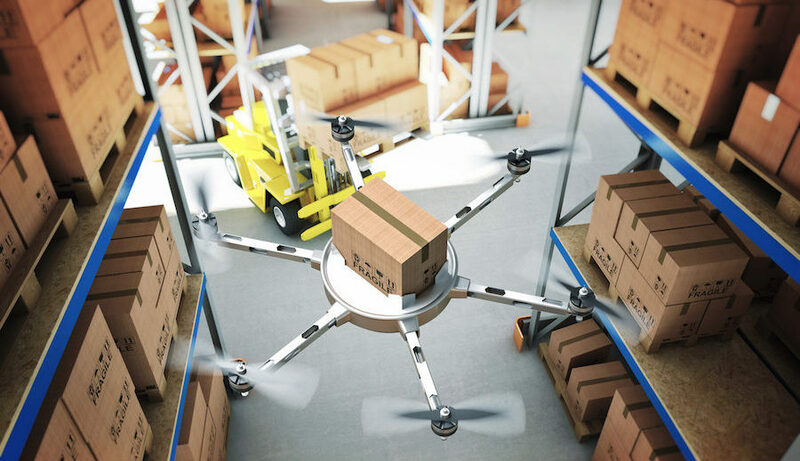 Drones may be able to change how we manage warehouse inventory. 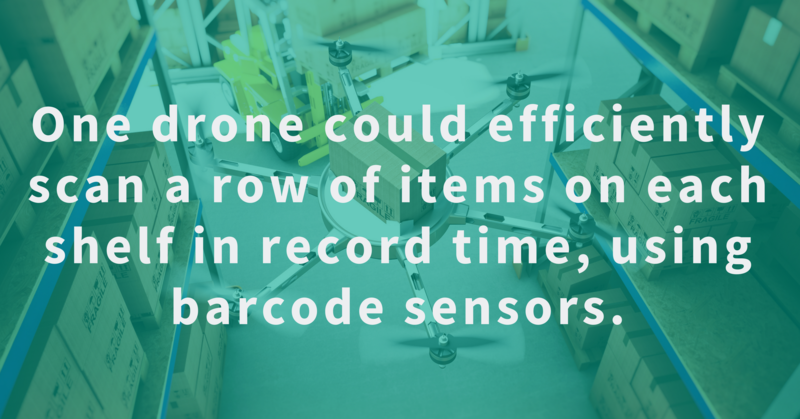 One drone could efficiently scan a row of items on each shelf in record time, using barcode sensors. This would take the place of an employee having to go up in a forklift to check barcodes, saving time and money and contributing to employee safety. Using GPS, drones can be guided to navigate in the air. In a warehouse, that might be a little bit more difficult because of tight layouts. However, with the advancements reported in Industry 4.0, many machines are starting to be able to communicate more with their surroundings. Perhaps this will be the case for drones as well. We may soon see “smart” drones flying around warehouses at ease! Drones might contribute to advancements in factory safety. Because of the size of drones, they may be able to improve safety for humans, by being able to fit into small or hazardous areas to inspect machines. Looking forward, drones may become part of the quality inspection future! Drones will not only be able to inspect equipment, but also monitor levels of production, obtain samples, provide aerial imaging and thermal and infrared scans of equipment. Drones could even be used to detect environmental quality problems with their sensors. Can you imagine a future with real-time inventory monitoring, tracking and automation? How about these little flying machines zooming around your factory, keeping tabs on your machines? Drones are definitely changing the world of manufacturing and the way we do business. It can only get better as the software and hardware for drones advances with time.